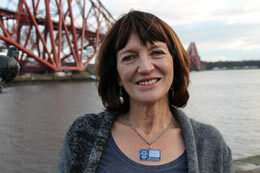 My name is Fiona Maxwell and I am qualified and experienced Scottish Tourist Guide and Driver. I hold the coveted Blue Badge, awarded after two years of intensive, in-depth training by the Scottish Tourist Guides Association. The Blue Badge holders are the only guides to be officially recognised by Visit Scotland. I conduct tours for individuals and small groups in English and French through Scotland and the North of England for visitors seeking a tailor-made holiday to remember. I am based in Edinburgh, the capital city and am well placed to collect visitors from major airports and train stations. I travel frequently myself, at home and abroad, and am well aware of the ingredients that make a successful, memorable holiday. I am a fluent French speaker. A member of the Institute of Advanced Motorists, I will drive you in comfort in my fully insured, ultra-low emission, spacious People Carrier. For larger and speciality groups, I can arrange luxury coaches and chauffeur-driven vehicles, while I accompany you as your guide. With my experience and extensive knowledge of our history and culture, I can take you to wherever you wish to go whether it’s a half day, full day or extensive tour you are interested in. Let me take the hassle out of your tour planning, so you can relax and thoroughly enjoy your holiday!